Chinese Democracy. Worth waiting for? It's anything o'clock, so you are expecting more Guns N' Roses Chinese Democracy news, yes? Of course you are. The Guns N' Roses album - well over a decade in the making - is now available to pre-order. And the band's co-manager, Andy Gould, has drawn an optimistic comparison between Axl Rose and Italian renaissance artist, Michelangelo di Lodovico Buonarroti Simoni. Andy Gould has spoken to US magazine Entertainment Weekly about the long delay in releasing Chinese Democracy and conceded that it is "the most expensive rock record ever made." "Art and commerce have always made strange bedfellows. When they asked Michelangelo to paint the Sistine Chapel, they didn't say, 'Can you do it in the fourth quarter?' so they can make their numbers. Great art sometimes takes time." MusicRadar gets his point… maybe. But isn't that a rather rash comparison? In fact, isn't that simply a crazy comparison? Michelangelo's greatest works include the statue of David and the painting of the Vatican's Sistine Chapel's ceiling, including Scenes From Genesis (not the Phil Collins band), the latter of which took him four years to complete. "Axl Rose is one of the most dynamic and gifted writers and performers in modern music"
Every year, millions of people come to experience Michelangelo's ornate work, over 400 years after his death. Will it be the same for Axl's Chinese Democracy? We hope so. "New fans will be blown away"
But let's judge when Chinese Democracy finally reaches retail on 23 November. The Chinese Democracy hype machine is now at full-throttle, with the following statement also released by the band's management. "The release of Chinese Democracy marks a historic moment in rock n' roll. We're launching with a monumental campaign developed by Gary Arnold and the Best Buy team that matches the groundbreaking sound of the album itself. Guns N' Roses fans have every reason to celebrate, for this is only the beginning." 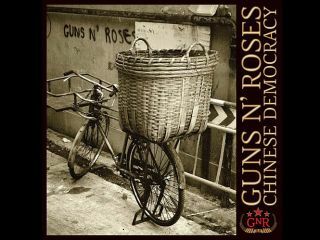 "Chinese Democracy is one of the most highly anticipated albums in music history, and Best Buy is thrilled to deliver this explosive and previously elusive release to Guns N' Roses fans. Longtime fans will be rewarded for their patience and loyalty to this great band, while a new generation of fans will be blown away," said Gary Arnold, Senior Entertainment Officer for Best Buy. "Axl Rose is one of the most dynamic and gifted writers and performers in modern music. Best Buy is excited to work with Axl to make the release of Chinese Democracy THE musical event of 2008." And, did you know: the Best Buy empire also includes Pacific Sales Kitchen and Bath Centers (PacificSales.com)? We do now. So if Best Buy browsers don't want to buy Chinese Democracy, they can still buy a rockin' Chinese fridge. So for Best Buy it's win-win, all round. Guns N' Roses' Chinese Democracy is released in Best Buy stores (US) on 23 November. Elsewhere in the world, it's in regular CD stores 24 November.